Aeroworks is proud to add the 120cc Freestyle 260 ARF QB-L to their line of QUICK BUILD – Light Series Aircraft. Designed with the demanding 3D pilot in mind, this new airplane features many exciting and revolutionary concepts that are sure to make it the hit of your hangar. The 120cc Freestyle 260 is the fourth airplane in our new QB-L Series and it is sure to impress with its light weight build quality as well as its impressive airframe strength and longevity. The QB-L features the same QUICK BUILD qualities that Aeroworks has been known for, assembling the 120cc Freestyle 260 can be done is as little as 10 hours! Along with all the great QB-L features Aeroworks has designed the 120cc Freestyle 260 to be more affordable to match today’s market pricing. We did not achieve the lower cost by compromising on build quality, flight performance or lowering hardware quality. We listened to our customers and achieved the lower cost by allowing them to glue in hinges and by removing some of the smaller accessories such as the Fuel Tank, Fuel Filler Dot, Throw Meter, Velcro One Wrap Straps and other smaller items they did not use. We have also elected to offer the Side Force Generators (SFG’s) as an optional accessory for those customers that want to use them. Included with the Freestyle 260 is an extensive Hardware Package that includes Carbon Fiber Wing Tubes, Carbon Fiber Stab Tubes, 7075 Aluminum Main Landing Gear, Aluminum Tail Wheel Assembly and the New Double Truss Compound Control Horns. All of these features are designed to be rigid and strong while providing the lightest weight possible for an airplane this size. Ball Links have been provided for the smoothest in control surface movement while still allowing for 55+ Degrees of surface deflection on the Ailerons and Rudder with over 65 Degrees of deflection on the Elevator! Engine Mounting Templates have been provided for Desert Aircraft and DLE Gas Engines, making installation simple even for the first time gas pilot. The airframe itself features a large wing to provide an incredibly low wing loading that is perfect for stable 3D flight! The new wing design also features Optional Inboard and Outboard Side Force Generators (SFG’s). These SFG’s are pre-assembled and easy to install or remove in seconds. Along with the new wing design are airfoiled tail surfaces with Optional SFG’s mounted in the stabilizer that provide great control authority even at low speeds. 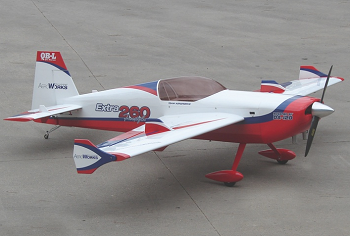 Aeroworks is excited to grow our Line of QUICK BUILD – Light Series (QB-L) Aircraft continuing with the 120cc Freestyle 260. With over 20 years in the industry, you can be assured that Aeroworks will be here to provide you with the amazing product support that we have been known for. Aircraft is Covered in Premium Cote Covering. Ultracote™ Color Codes Provided for Repair Purposes. Aeroworks offers replacement parts for all of our aircraft, please call 303-371-4222 for price and availability.